CHECK 3—can you hear me? CHECK 4—is the room empty? CHECK 5—can you hear me? in. kill all the bro poets. actually you know what, kill all the bros.
mics in the white room. kill all the power dynamics in all the rooms. uled the endless summer reading during dyke march this Saturday. language of avoidance that made it so hard for me to write this. CHECK 11—is anybody out there? 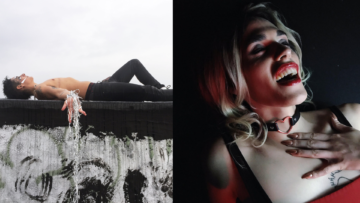 Andrea Abi-Karam is an arab-american genderqueer punk poet-performer cyborg, writing on the art of killing bros, the intricacies of cyborg bodies, trauma & delayed healing. Their chapbook, THE AFTERMATH (Commune Editions, 2016), attempts to queer Fanon’s vision of how poetry fails to inspire revolution. Simone White selected their second assemblage, Villainy for forthcoming publication with Les Figues. They toured with Sister Spit March 2018 & are hype to live in New York. EXTRATRANSMISSION (Kelsey Street Press, 2019) is their first book.